Season’s bests of 52 not out by James Vince and 4-67 by Gareth Berg stood out for Hampshire on an entertaining opening day in the LV= County Championship Division One match against Sussex at Hove. Sussex managed to total 251 largely thanks to an aggressive fifth wicket stand of 115 in 24 overs between Luke Wright, who hit a six and 10 fours in 59 from 77 balls, and Chris Nash, whose 76-ball 48 with nine fours was his best score of a so far poor summer with the bat. Hampshire hit back well with the ball, though, and then replied with 116-4 in 34 overs as Vince led the way with a 61-ball half-century that included nine fours. 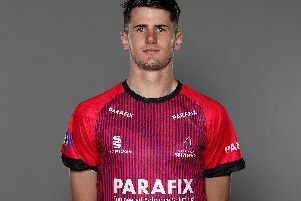 South African-born former Middlesex seamer Berg took 3-24 in the morning session to check Sussex from 47 without loss to 87-4, and later picked up a further wicket as the home team slumped from 202-4 following the Wright-Nash counter-attack. Berg’s scalps were all the result of sharp catches in the slip cordon, with Vince pulling off a particularly brilliant diving effort high to his right at second slip to remove Ed Joyce for nine. Then, to the very next ball at the start of the following over, Wright fell to slow left-arm spinner Danny Briggs, who made one spit up from just short of a length to take the edge of the bat and loop to slip. Robinson (6) was caught at first slip to give Berg his fourth wicket, Brown (7) edged Fidel Edwards also to Sean Ervine at first slip, and Hudson-Prentice (15) spliced an attempted pull at Bird to mid-on. Vince claimed his third catch at second slip when Steve Magoffin, on 11, flashed at Bird to become the last Sussex wicket to fall. That gave Bird final figures of 3-69. Hampshire’s reply got off to an unfortunate start when Adams, backing up, was run out when Magoffin deflected a fierce straight drive by Sean Terry into the bowler’s stumps.